The first days of summer temperatures come to western Europe this week as a Spanish Plume forms – temperatures will reach 33-37 °C in parts of Spain, up to 32-35 °C in SW France (locally maybe even hotter) and about 26-28 °C in parts of UK and Ireland. Break out your summer clothes, warm and stable weather will push the temperatures into high 20ies and 30ies across western Europe this week – certainly the first true feel of summer for the British Isles, Ireland and France. A strong area of high pressure forms across western Europe and brings very stable, sunny weather and temperatures above 30 °C over much of the region. The stable, warm spell is already underway today and will persist across the region until Thursday to Friday. The warm weather across UK and Ireland is underway today (May 23), with daytime highs expected to reach up to 23 °C in southern UK. The warmest day will likely be Thursday (May 25), with daytime highs up to 27-28 °C in southern UK, but temperatures up to 26 °C will stretch all the way up into northern Scotland as well as Ireland. Warm weather will persist through Friday. Temperatures will already soar up to 35 °C in parts of southern, eastern and southeastern Spain and up to 36 °C in Portugal today, May 23. Peak temperatures will again reach up to 35 °C tomorrow, May 24, but will shift into eastern and northeastern Spain, while Portugal will ‘only’ reach up to 30 °C. The highest temperatures are expected on Thursday, May 25, up to 36-37 °C in northeastern Spain, while the northwestern part of the Iberian peninsula already cools. France will also be affected by the hot weather, as temperatures push up to 24-26 °C across much of the country today, May 23, except for the southern coast which will already push over 30 °C locally. The hottest day will likely be Thursday, May 25, with temperatures up to 35-37 °C across southwestern France and around 30 °C in southern France. Very warm to hot weather will persist also on Friday, May 26, but cools on Saturday. Early summer to end with a bang? 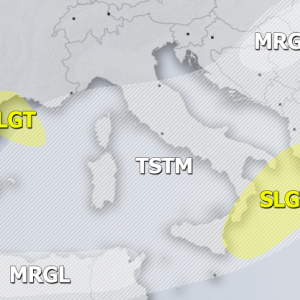 A cutoff low pushes from the west into the Iberian peninsula by Friday and brings unsettled weather, with potential for severe thunderstorms. Moderate to high instability will likely build up ahead of the system, with environments favourable for organized thunderstorms. More on that later in the week. The strong ridge, however, will likely persist, moving into N-CNTRL Europe while being flanked by areas of lower pressure in the east and the west – a textbook omega blocking pattern forms: warm and stable weather over north, central and south Europe, unsettled, colder and locally stormy weather in western and eastern Europe. We will be monitoring the pattern and providing updates. «Next Post The most active and best lightning in Europe – where is it?